Hairdressers on the ground floor of Gary Court on London Road. 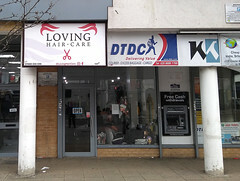 It was previously both a hair/beauty salon and a fabric shop/dressmakers called Morning Star photo, but the fabric shop moved to the unit next door some time around the start of 2019. It's not clear whether Loving Hair Care is still run by the owner of Morning Star. The beauty salon opened in the left-hand side of the unit some time between April and July 2015 photo. Some time in 2017 or 2018, the owner took over the right-hand side of the unit, moved the beauty salon there, and started selling fabrics, African groceries, and beauty products in the left-hand side. Most of the fabrics were only available in full 6-yard lengths, but a small selection of them could be cut to 2 yards or 4 yards. Last edited 2019-03-21 11:56:19 (version 17; diff). List all versions. Page last edited 2019-03-21 11:56:19 (version 17).